Philip Townsend was born in 1940, took the first photographs of the Rolling Stones. He worked as a photographer from 1960 until 1969, and his eclectic collection of images caught the essence of the swinging 60s, when the upper classes mixed with an emerging new elite of actors, musicians and designers. Known as “Mr Sixties”, he photographed mainly in black and white, and with a twist of eccentricity. His subjects included Frankie Howerd on a skateboard, Elizabeth Taylor and Richard Burton, Jimmy Page in his pre-Led Zeppelin years, members of the aristocracy, police officers on a goodwill mission to Monte Carlo, the landmark Biba shop in Kensington, scenes of Carnaby Street, and models such as Linda Keith and Rory Davis. As the Sixties swung and Britain subverted the old order, photographer Philip Townsend (known as ‘Mr Sixties’), captured many of the stars of that decade, including the Rolling Stones was there to record all the prime people of the time, beautiful and ugly alike: the debs and their beaux, louche lords and club owners, press barons and business moguls, stars and socialites, artists and creatives, royals and ruffians, and above all the new aristocrats of pop and rock, spearheaded by the Beatles and the Rolling Stones. And he documented the peacock gear they wore, the sleek cars they drove, and the aeroplanes that flew them to fresh horizons. 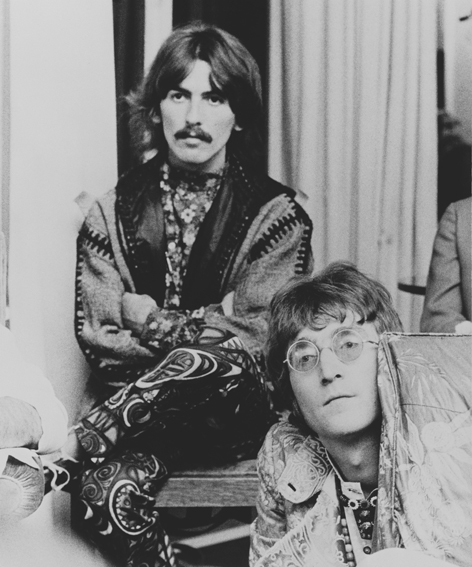 He also documented the Beatles meeting the Maharishi Mahesh Yogi in London in 1967. Philip photographed the Fab Four and their consorts, including Paul McCartney’s girlfriend Jane Asher, as they chatted and even watched TV. In the days before layers of management control, the group were quite accessible, and Philip was able to come and go as he pleased. Remarkably, Townsend's entire photographic career exactly spanned that most remarkable of decades, when London was the coolest of capital cities: he took his first serious pictures in 1960 then, in 1970, he put away his cameras for good and casually consigned his pictures to a cupboard. When he looked at them seriously a few years ago, he found a half-forgotten treasure trove, a time capsule that vividly resurrects those photogenic times. The rescued works are now sought by magazines and newspapers throughout the world, by galleries like the National Portrait Gallery, and by collectors. The reason is simple: Philip Townsend's pictures are the Sixties. Philip’s work is held in the V&A and the National Portrait Gallery, where it was included in the Beatles to Bowie exhibition in 2010. An exhibition of his images, Mister Sixties, was held at the Lowry gallery, Salford, in 2010. His work was prominent in the exhibition Rolling Stones: 50 at Somerset House, London, in 2012, and is included in Exhibitionism, the Stones exhibition at the Saatchi Gallery. In 2009 he was awarded an honorary degree by Arts University Bournemouth.